This Saturday, Adil Anwar will fight Dale Miles in an eliminator for the British Light Welterweight title. This fight is slipping under the radar, maybe because it's on the under-card of the big David Price Vs Audley Harrison fight, but one thing is for sure, this is a very intriguing bout. 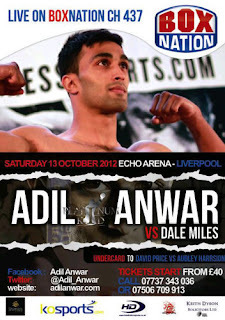 Dale Miles recently stopped English champion, Curtis Woodhouse, Anwar out-pointed Dave Ryan over ten rounds, and scored two knock-downs in the process. Miles is a typical pressure fighter, never takes a step back, get's hit a lot and has knock-out power. Anwar is a typical boxer, good movement, fast hands and has a good defence. I'll pick Anwar to win by decision, but it won't be easy. And it wouldn't surprise me at all if Miles got the stoppage. Who do you think will win this British Light Welterweight Title Eliminator bout? Miles or Anwar?